Authorities are seeking help in finding a German Shepherd rescue mentor dog who was stolen from his owner's home in Castro Valley in unincorporated Alameda County on Sunday. 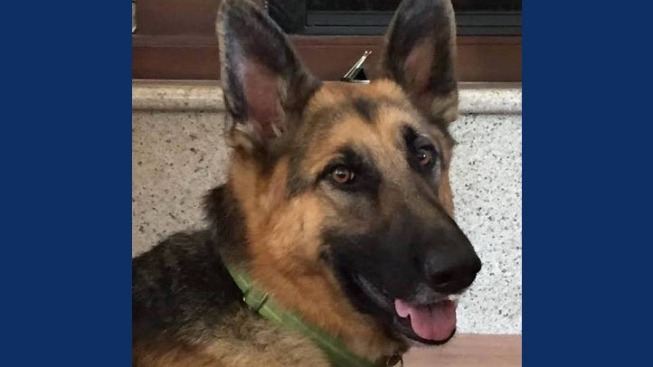 Murfee, a 3-year-old black and tan German Shepherd, was stolen from his yard near Palomares Road in Castro Valley between 3:30 p.m. and 5 p.m. on Sunday, authorities said. Murfee weighs about 80 pounds and is tall and lean and was last seen wearing a lime green collar with ID tags, according to authorities. He is micro-chipped and neutered. Authorities said Murfee has helped to mentor hundreds of rescued German Shepherd Dogs to help them learn proper social skills before they moved on to their homes. Murfee helps teach rescued German Shepherds and Belgian Shepherds, many of whom are very under-socialized, how to get along nicely with other dogs and what proper dog-to-dog etiquette is, authorities said. It's important that dogs learn those skills before moving into their new homes, dog experts said. Authorities said Murfee's owner, JJ Jacobson, has worked with German Shepherd Rescue since 2002 and has taken in as many as 3,500 German Shepherds to be fostered and successfully placed in new homes. Murfee was taken into police protective custody after he was being thrown against a wall during a domestic violence disturbance, authorities said. Because Murfee was so young, animal control officials reached out to Jacobson to care for him while the case went through the court process. A few months later, the suspect gave up all rights to the puppy, and Jacobson adopted Murfee. Authorities are trying to raise $10,000 for a reward for Murfee's safe return and $7,000 has been raised so far. The Go Fund Me page designed to raise money for a reward has been created. A Facebook page has also been set up to help in the search effort.